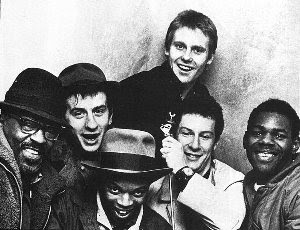 In many ways The Beat were the heart and soul of the two-tone movement of the late 70s and early 80s. Where Madness was beloved of the working class masses, and The Specials were the political consciousness of the movement, The Beat somehow seemed to have their finger on the pulse of the youth of the day. Maybe that's why they had staying power beyond so many of the other bands (except perhaps Madness). The Beat featured a bonafide ska legend in Jamaican saxophonist Saxa, and becuase of that always seemed to infuse their music with a more care-free Jamaican reggae vibe than the other two tone bands. They were able to blend soul, ska, and power pop in such a way as to make themselves relevant to the 'new wave' sound beginning to take hold of mainstream musci. Add to that guitarist and vocalist Dave Wakeling's contemporary voice and style, and the toasting of Ranking Roger, along with an accomplished set of musicians, and the ingredients were all there for a world class band. The Beat didn't disappoint scoring a string of hits both in and out of the UK -- "Mirror in the Bathroom", "I Confess", "Save it For Later", "Can't Stand Losing You", "Tears of a Clown", and featured here, their last single 1983's "Ackee 1-2-3", which only made it to #54 on the charts. Still, it's a fantastic song that I think captures the band's tone and style quite well. The calypso like sound, combined with the overall ska style gave it the indelible Beat sound, but at the same time it embraced enough of a pop element that like all of their tracks made them accessible to both ska lovers and casual pop listeners. That was the main essence of the band's genius. After the break up The Beat spawned two other critically acclaimed and extremely popular hit-making bands -- General Public and Fine Young Cannibals. saw the English Beat last week in Vegas at the High Rollers Scooter Rally and it was insane! 400 rude boys, skins, scooter boys, mods skank'n big time! Also saw them Tuesday night in Eugene. the show sold out and Mr. Wakeling and new comer Antone First Class did not disappoint! Agreed. I saw them here in Seattle a couple of years ago and thought they put on a great show. One of the most fun shows I've been to in recent years actually.